Wood, Frank Watson (1862-1953). watercolour signed and dated 1911. Wood has painted the 2nd Cruiser Squadron possibly because he was commissioned by the Rear Admiral Commanding, Rear Admiral Sir George Warrender Bart CB CVO or one of his captains: Wood was well known as a marine artist even at this stage of his career. 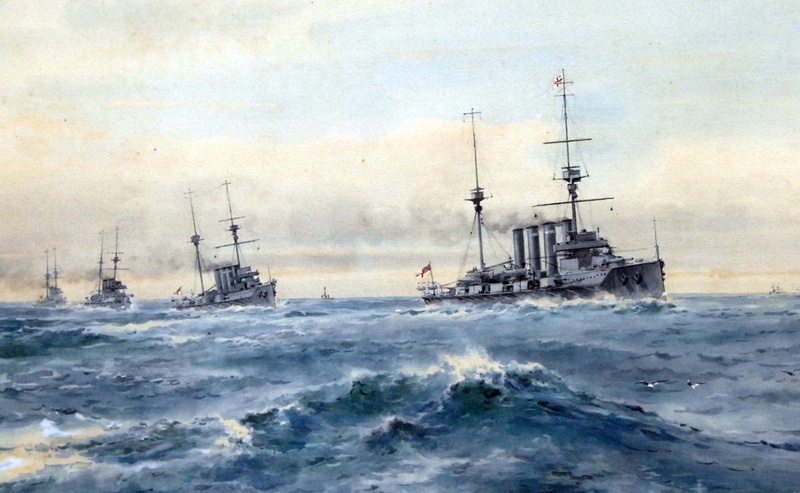 Also in the squadron at this time with SHANNON (Captain G H Baird) were HMS ACHILLES (Captain W Nicholson), HMS COCHRANE (Captain W E Goodenough), HMS NATAL (Captain W R Hall) and HMS WARRIOR (Captain O F Gillett): Wood has painted only four of the five ships, one perhaps being in refit or on detached duty when this watercolour was executed although one of the other warships on the horizon could possibly be the fifth member of the squadron. One of the Minotaur Class, SHANNON (the 9th HM Ship bearing the name when she was launched in 1906, the first dating from 1765), went on to have a good career, surviving the First War and Jutland unscathed and being scrapped in 1922. The others of the 2nd CS shown here (and these ships were all of the Warrior Class) were not so lucky: NATAL blew up in Cromarty Firth on 30 December 1915 faulty cordite being suspected; COCHRANE was wrecked in the Mersey 3 years later; and WARRIOR was badly damaged at Jutland and had to be scuttled afterwards. ACHILLES, as SHANNON, was scrapped in 1922 having earned herself fame by sinking the German raider LEOPARD in 1917 off the Shetland Islands.